Photo by Becky Pearman, used with permission. Ride Between the Rivers race day dawned cool and overcast. The forecast was calling for warm temperatures and sticky humidity. I had come to the West Virginia mountains from the oppressive summer heat of DC for this race and thought this "warm weather" was rather cool; however, the horses and Liz clearly did not agree. 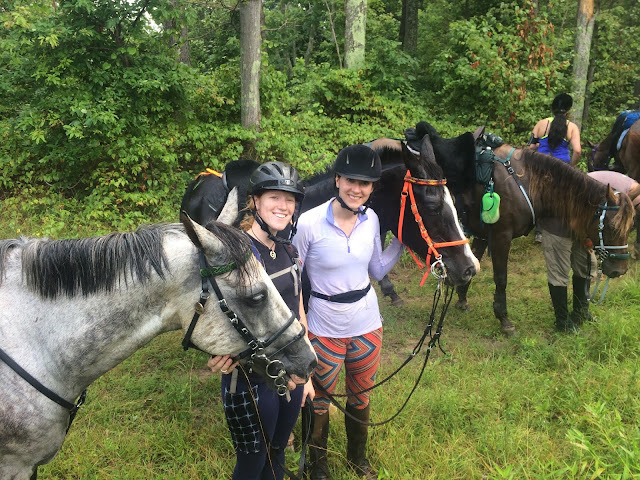 Liz began talking hydration and electrolyte strategy, emphasizing to me how important it would be to ensure the horses drank enough on the trail. 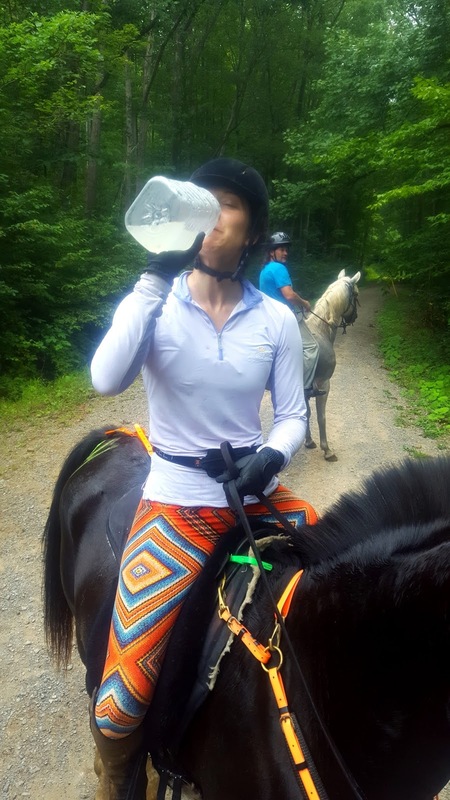 She had mixed up her electrolytes for all the horses in our group the night before, and she set about ensuring everyone was all set for the day. Afterwards, we wandered over to the race start to watch the 50 mile race kick off. The 50 mile race started with much more action than ours! Cameo by Dom, who's ride recap can be found here. Photo by Dom's Mike, via Facebook. Liz made sure to tell those of us watching the 50 kick off that our start would be much less exciting. She stressed that we were going to try to walk out of camp, avoiding exciting the new horses and riders too much. 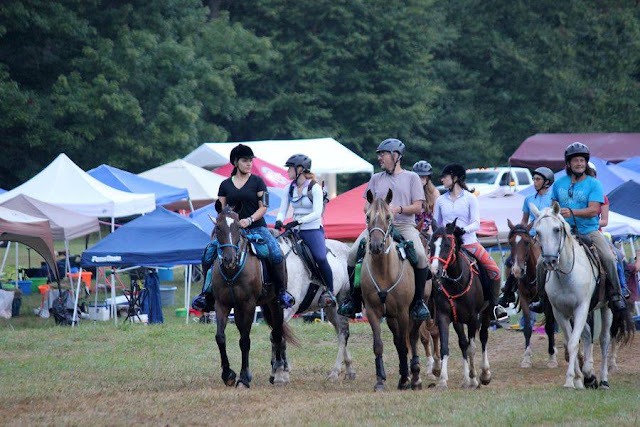 With that information under our belts, we wandered off to get dressed and tacked up for the start of our 30 mile race. All dressed up with places to go! I'd stressed over what to wear for this ride for a month, finally deciding on a pair of old full seat Kerrits and my half chaps and paddock boots with a Kastel Denmark shirt. Unfortunately, my full seats were still soaked and sandy from my unceremonious dismount the day before. Liz came to the rescue with a pair of ridiculous orange and blue tights. To my inner dressage queen's delight, they perfectly matched Q's tack and my lavender Kastel shirt. 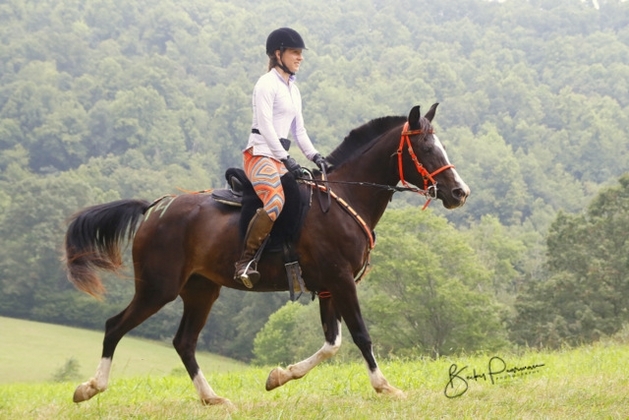 While annoyed at the lack of belt, I jumped at the chance to look like a real endurance rider in my crazy tights. Pretty mare in her bright orange! 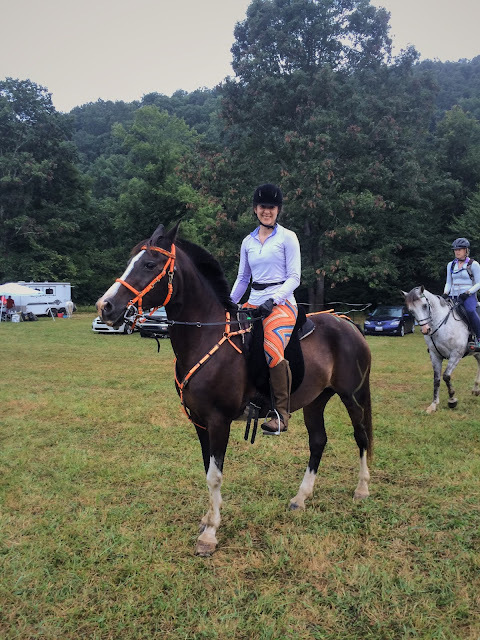 Q was decked out in her Ansur treeless saddle, that Liz had graciously covered with sheepskin for my non-endurance hardened backside, and bright orange synthetic tack. She wears a crupper. Putting that on gave me flashbacks to my early childhood, where the fat ponies would often go in a crupper to keep the saddle in the right place. Left to right: Lauren on Shiloh, Me on Q, Liz on Griffin, Charlie on Dakota, Dan on Butch, Jess on Lilly, Carlos on Gracie, and Orion on Nell. We were going to be riding this 30 mile race as a large group. 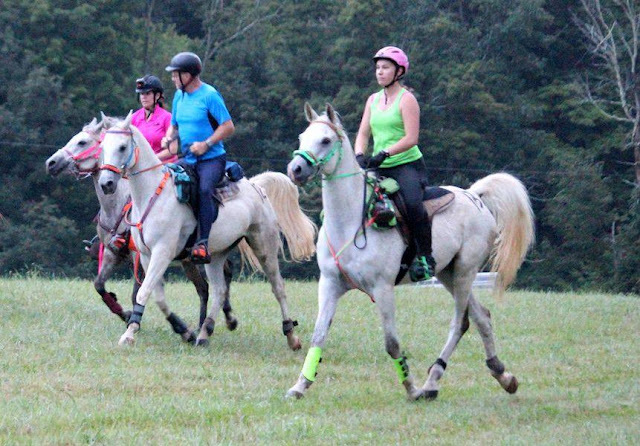 This isn't the normal way endurance riders will ride a race. Because we had several combinations of veterans with newbies (Shiloh and Q being extremely experienced veteran horses with newbie riders, and the rest being a combo of experience levels), we were going to try to keep together as long as possible to ensure as many riders had a chance to finish as possible. As Liz had requested, we kept the departure from camp quite low key. The whole group chatted and laughed as we strolled out onto the trail at a leisurely walk. Jess and Carlos leading the way out of camp on our first loop. Our 30 miler was made up of two loops. Our first loop was 15 miles, with one big steady climb, a steep downhill, and four river crossings. After this loop, we returned to camp for our first vet check and 45 minute hold. Following the hold, we headed out on the second loop a much more difficult 17 mile trail. Much of the second loop was very rocky, narrow, and steep, where we climbed to the top of the mountain. We only crossed the river twice at the very end. This made it harder to keep the horses cool and hydrated. Continuing out of camp on our way to the start of the first loop. The start of our first loop was pretty easy going. We did a little trotting and a little walking. I spent the first half of the loop getting to know Q a little better. She's an amazing horse with a massive trot stride and incredibly smooth gaits. While she is a very agile little horse, she lacks the maneuverability of my dressage horse. I fiddled with her a little, playing with bend and balance changes. With so many miles left to go, I didn't want to wear her out or change her way of going. Instead, I settled for giving Liz a running commentary of the things I was trying on Q. Giving Liz this feedback started her thinking about some chronic weaknesses Q has demonstrated in the past. I love how dressage work helps us pinpoint issues with horses! The group looking fresh on the main road section of the first loop. We quickly came to our first river crossing, where the professional photographer was waiting for us. Liz suggested trying to canter through the water, but Q was having none of that suggestion. Instead, we ended up trotting through while I giggled uncontrollably. It was so much fun! Note the giggling like an idiot. The group traded off leaders, with Dan holding up the back of the group. This camaraderie of endurance riders was a really neat aspect of the race for me. Instead of being every man for himself, riders were happy to attach themselves to groups and be carried along at a similar pace. For some it was about giving confidence to their horses, for others it was about companionship. 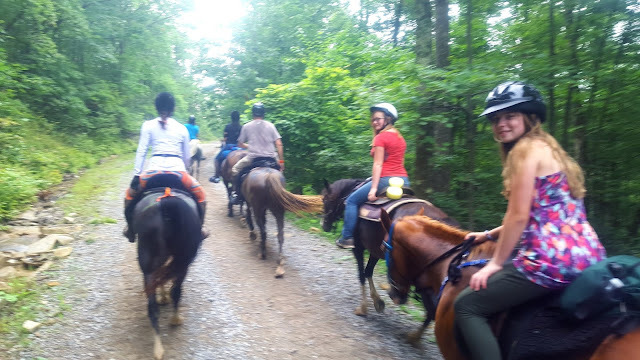 For our unique group, it was about instructing the new riders and horses and maintaining a positive experience. Most other riders will ride with many different riders throughout a race, as they are all riding an individual pace and strategy. Our group was trying to maintain a group strategy, which made things more complicated. Still, it was fun to tag along with other riders as our journeys matched up for a time! Liz did a great job keeping us all together and on task. She was very good about letting riders take control and experience new things, letting both Lauren and I lead at several points on the trail. She and Dan acted as voices of reason, helping us all to regulate our pace so our horses stayed in good shape. Liz and I embracing our silly sides on the trail. When we came to the long gradual climb on the first loop, Carlos and Jess were in the lead. The trail was a wide gravel road, so they let their horses out a bit. Q was happy to follow along behind them at a ground-eating canter. I am amazed at the mare's ability to canter on such rough gravel footing without taking a single funny step. She seemed to float over the ground, barely touching a foot to the road. It was truly a unique feeling! 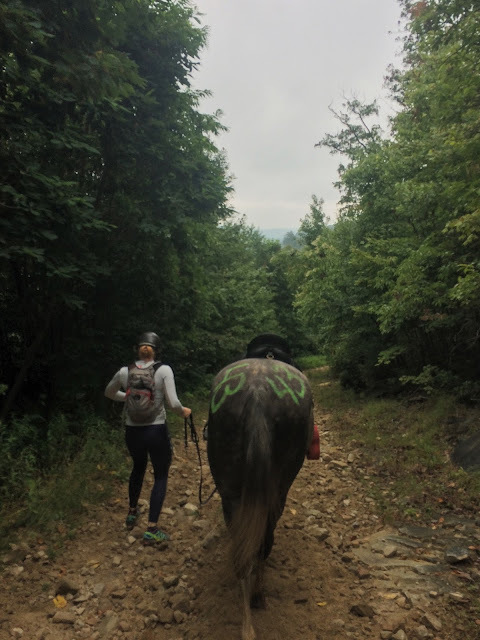 Of course, cantering uphill isn't a smart thing to do when you're trying to conserve your endurance horse's energy. Liz started yelling up to us to slow down on the hill, and I ended up having to urge Q a bit faster to pull up Carlos and Jess who had surged ahead. After pulling everyone to a walk to finish the climb, Liz let me know Q probably could have continued cantering the incline and been fine. However, the less confirmed horses would be too worn out to finish the race if they had been allowed to motor up the mountain at such a pace. As it was, a few of the other horses were quite winded from the exertion. To ensure all the horses recovered from the climb, Liz had us dismount at the spotter station at top and let the horses have a bit of breather. We encouraged them to graze a bit on the available foliage, and walked them until they cooled a bit. When I first dismounted, Q was breathing a bit hard. Within minutes she had stopped breathing hard, and was looking around bright eyed and full of energy. A bright eyed Q looks over the other horses, as they rest a bit at the top of the climb on loop one. On the second half of the loop, we crossed the river two more times. Each time we crossed we made sure to slow down and let the horses drink if they wanted. Q only drank at the final water crossing, and even then it wasn't much. She didn't seem dehydrated, so I wasn't too worried. Another reason we slowed at the river crossings was to sponge down the horses. Each rider had a large sponge tied to the saddle by a long string. The riders would drunk their sponge in the water, and use it to rinse the horse's necks, shoulders and haunches to help cool them. Our group entering one of the final water crossings. Note Liz's red sponge, ready to dunk in the water and rinse off Griffin. Liz wanted to be sure all of us passed the first vet easily, so after our final water crossing we all walked the last bit into camp. 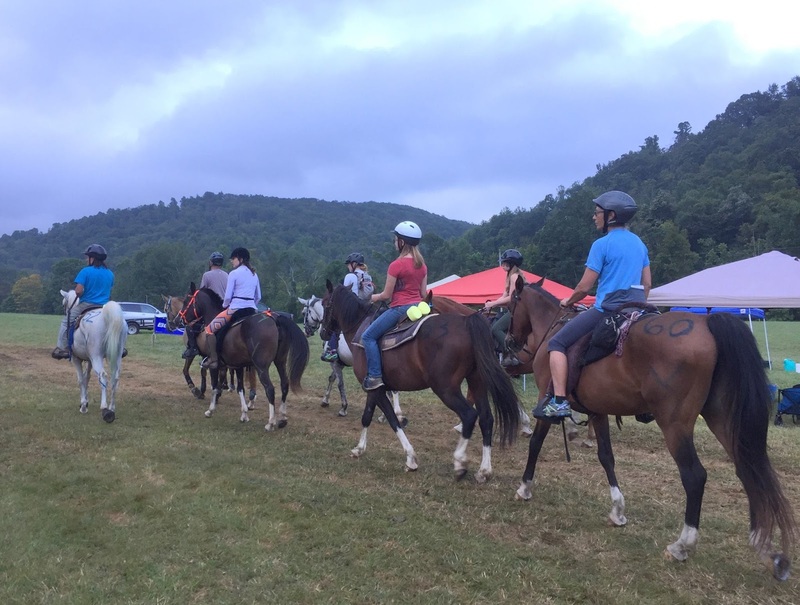 At the edge of the field outside camp, we dismounted and walked our horses in. By the time we arrived, all the horses appeared to be in good form. No one was breathing hard and everyone looked pretty fresh. Vetting in was an interesting process. As we crossed the "finish line" of the loop, our numbers were recorded and our times were reported to us. Following our arrival, we had 30 minutes to strip the tack from our horses and prepare them to vet in. 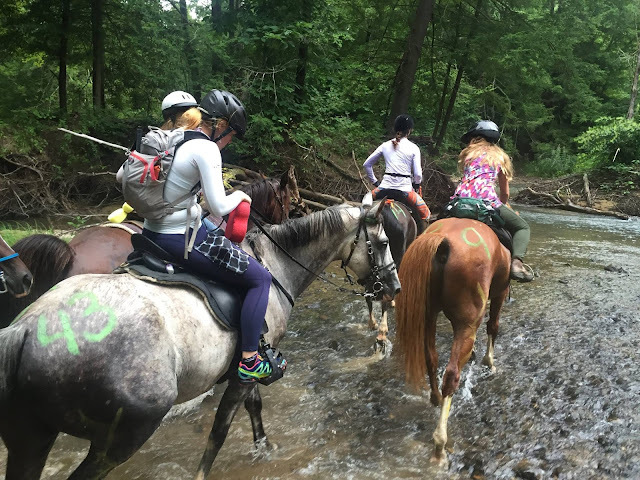 We rode over to our sponging station, manned by the outstanding Nicole (who's write up of her horses and Carlos' trip is here). 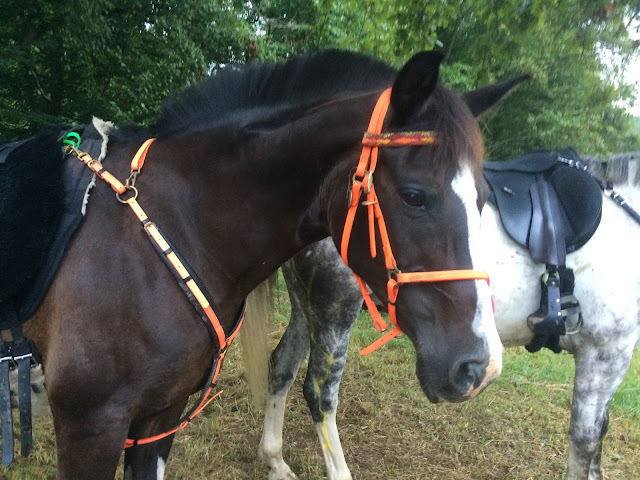 Q and Shiloh were ready to vet immediately, so we stripped their tack quickly and sponged off their sweat marks. Then we headed over where the vets took an initial pulse (Q and Shiloh both at came in at 48), then looked over each horse for any issues (specifically: hydration, lameness, and metabolics) and listened to their gut sounds. We then trotted the horses out to allow the vets to evaluate lameness, and pulsed them out. (Q pulsed out at 48 again, 24 year old Shiloh pulsed at an amazing 40) All this information was recorded on each horse's race card. Vets rank horses on a letter scale (A, B, C, D, F). The goal is to achieve all As on your vet card. Any horse below a C will be pulled from a race. The vets take their job very seriously. Carlos and Jess waiting to vet in Gracie and Lily. Griffin was panicking a bit about being slightly separated from Q, which kept his pulse slightly elevated. He stayed below the threshold and vetted out alright, but Liz was worried about him. Once we reunited him with Q, he calmed down and looked no worse for wear. Upon vetting through, we presented our ride cards to have our times recorded. This let us know when our time would start back up, and we could head back out on the trail. 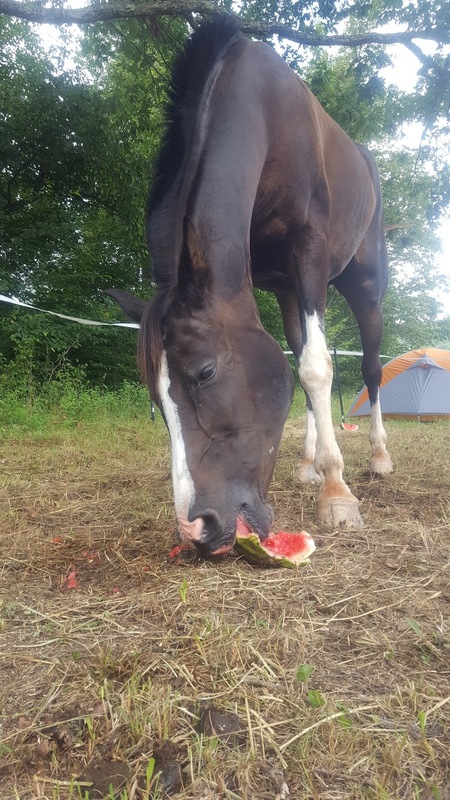 We had 45 minutes to care for the horses and relax a bit a camp. Having a fit horse like Q or Shiloh is incredibly helpful when vetting, as you don't waste as much time trying to get the horse vetted in. 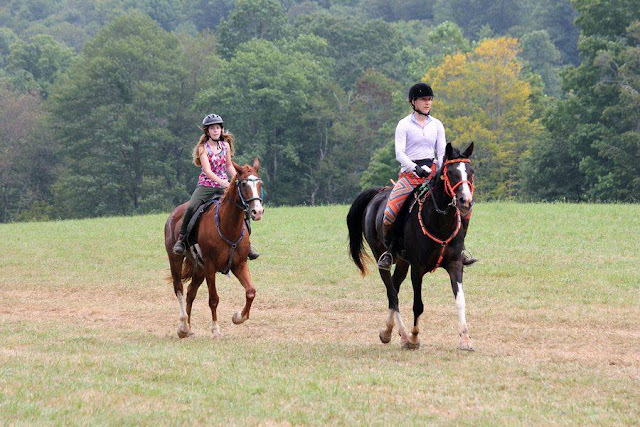 As Lauren and I realized, our horses were practically ready to vet the moment we got off. We fed and electrolyted the horses, then fed and electrolyted ourselves. Being used to much hotter weather, I was feeling pretty great. I drank a fair amount of water, as I wasn't carrying any with me. And I ate a whole pint of strawberries, which I credit carrying me through the final grueling loop. As I am used to hacking my horse out up to 10 miles and riding multiples regularly, the riding wasn't feeling exhausting. I did notice my calves were a bit worn out from the posting trot. Quickly, it was time to tack back up and head out on the second loop. We gathered everyone together again, and took note of Nicole's request to watch Lily for dehydration issues. The horses seemed reluctant to leave camp this second time, so it took some urging to get them to climb the steep hill out of camp where the photographer was waiting (see photo at the top of the post). Trying to capture the group headed down the road at a fast clip. The second loop started with a fairly flat section on the wide main road. Quickly, however, it devolved into a rocky and narrow bit of climbing. The trail was quite twisty and full of trappy water holes that held us up. With such a big group, we easily became stuck behind other groups on the trail. We would follow them until they either sped up or pulled aside to let us pass. A section of slightly washed out rocky trail. Many sections were much narrower than this. This section of trail was a bit frustrating. The easy pace we held for the first loop wasn't to be found. Carlos often led, sometimes going a bit too fast than the rest of the group should have been going. Liz led for a bit on Griffin, but he quickly let her know he was not comfortable in front. Finally I jumped into the lead with Q, and we navigated around most of the large mud puddles and twisty turns. Some of the puddles we stopped for, as Q adores drinking from the nastiest muddiest water she can find. I had a ton of fun leading on this part of the trail. It was fun to trot along and try to scout out the best path through the more technical bits. Q was a huge help, often telling me exactly where to pilot her. Quintessential West Virginia mountains, right here. 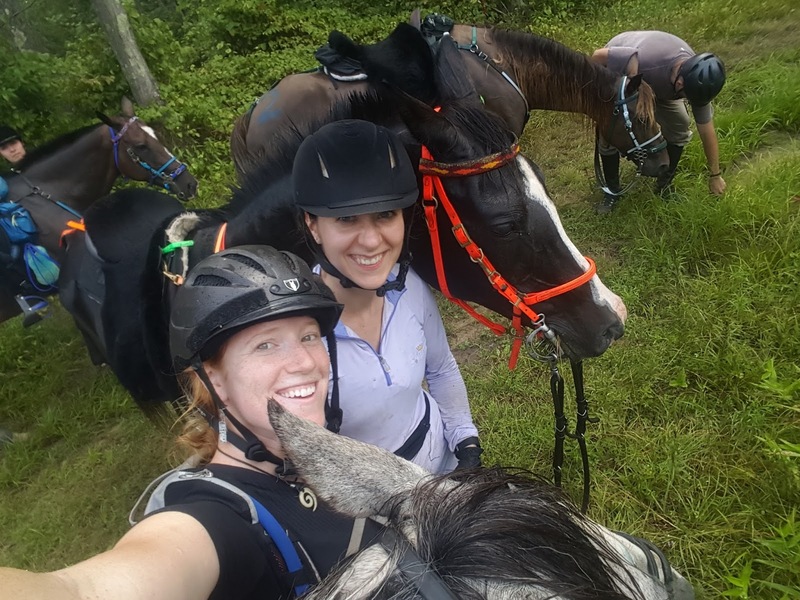 With the trail being quite a bit of heavy climbing, we took multiple breaks to let the horses rest. Q was much more interested in grazing on the second loop, as well as taking a few good drinks of scuzzy brown mud water. The other horses were starting to look a bit more tired. Especially once we passed the first spotter and finished the climb to the top of the mountain. Partaking of some moonshine at the Rattlesnake Drop spotter station, before continuing our climb. It wouldn't be a real WV ride without moonshine, would it? 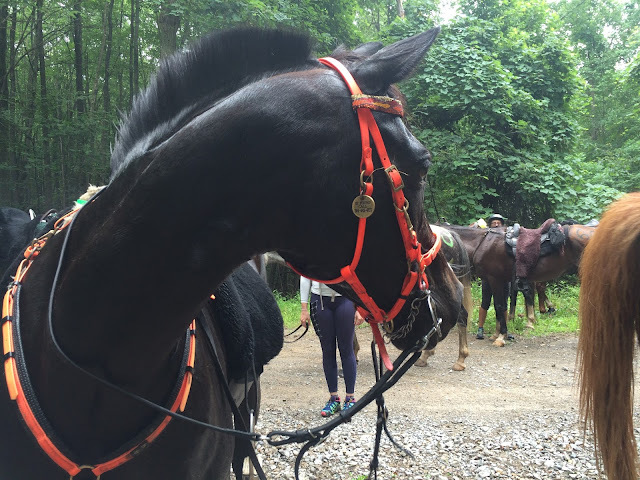 Once we reached the top of the mountain, we dismounted and let the horses rest again. The trail was about to make a turn and start on a long downhill section. It had started to rain a bit at this point, misting our already wet horses. Q was doing alright, but the others looked like they would benefit quite a bit from a long walk. The humidity was high, keeping the sweat from drying properly and making all of us soggy messes. A sweaty Q and I waiting for the rest of the group to catch up with us on the pipline section of the trail. We meandered for awhile, letting the horses forage a bit and lamenting the lack of water holes for them to drink. At this point Liz started checking pulses to see how everyone was recovering. Q, Shiloh, and Dakota were fine, but everyone else was struggling to drop enough. We mounted up. At this point, Liz formed a new ride strategy: walk all the steep bits (inclines and drops) and trot the flatter bits. Soon after moving off, Jess asked me if I thought Lily looked off. When I took a closer look, she did look pretty off when trotting on the rough trail. Jess agreed, and decided to walk her. Carlos stayed with her, hoping Lily had simply stepped on a rock and would be recovered after she had walked for a bit. Liz and I posing before taking pulses on all the hot and sweaty horses. Around this time, Liz shared that she was a little worried about how Griffin was handling the rocks. He seemed to be very worried about the footing, and was trying to drag her to the softer footing at the sides of the trail. So far she wasn't super worried, but it was clearly weighing on her mind. While all of this was happening, the trail started making a substantial downhill turn. Still extremely rocky, Liz decided to hop off Griffin and run alongside him down the descent. Q and I followed her, as did Lauren and Shiloh. We quickly left behind Jess and Carlos, though the others stayed behind with them. Liz having a bit of a "Forest Gump" moment with Griffin. She just kept jogging and jogging and jogging. The trail was extremely rough through this section. Griffin actually handled it beautifully with Liz on the ground. Q and Shiloh did just fine, as well. Though we walked quite a bit behind Liz and Griffin. After the crowd of eight riders, it was quiet and lovely with just the three of us. However, the weight of the time cut off for the race and the distance we still had to travel was weighing on us. Eventually we hit a slight incline and Liz mounted back up. We waited a bit for the others, where Dan, Orion, and Charlie joined us. They let us know that Lily was still struggling. Liz decided we had best separate so we all had a chance to finish. Our group of eight had come to a point where we were splitting to protect the chances of finishing for the largest group of us. Our smaller group of six headed off down the trail, finding it finally leveling off onto the main road. All of our horses seemed to be doing alright, so we kept the pace fairly peppy. Finally hitting the finally spotter station, where we found out we were going to be the last riders on the trail. We let the spotters know about Jess and Carlos behind us, tanked up on some moonshine, and headed across the river towards camp. 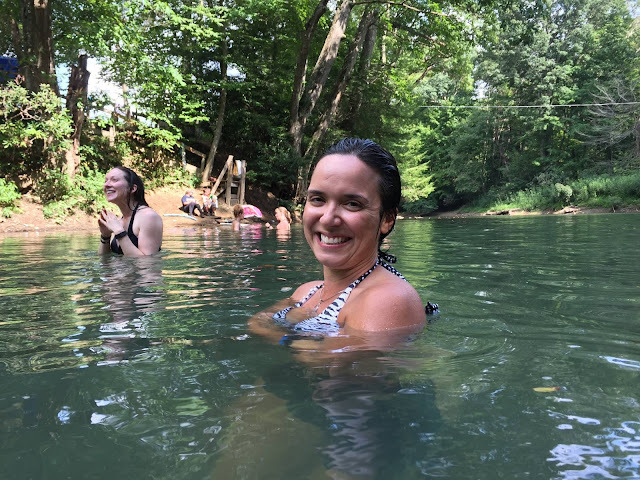 Letting a hot Q enjoy her time in the cool river. After the river, we had a quick section of trail through the woods. Liz encouraged me to take the lead with Q, and go for it. This was the most fun part of the trail. Q trotted and cantered along with her ears pricked boldly forward the whole way, and I settled into her rhythm with a smile on my face. By this time I had a feel for her spooks, and just needed to close my legs for her to continue going forward. At one point, we cantered along through a narrow S-curve between trees. I called back to Liz that Q needs lead changes to make sections like that much more fun! She laughed and told me she's going to have to learn a lot more about dressage before that point. When we got to the final bit of trail, Liz told Lauren, Charlie, and I to keep trotting on into the finish. She and the others were going to walk in. She wanted to ensure Griffin pulsed down enough and Dan's horse was lame from stepping on a rock. Liz wasn't worried about our horses' pulsing down in the slightest. We headed off, having a blast trotting up to the finish. Old Shiloh and a happy Q carrying us to the 30 mile finish. The rest of the group was a more mixed bag. Charlie and Dakota finished without a problem. Butch's stone bruise was really causing problems, and he was spun out of the vet. Orion's Nell was also failed by the vets in the trot up. Neither Dan or Orion completed, but both horses trotted out fine the next morning. Jess had ended up pulling up out of the race when she and Carlos reached the last spotter. A horse ambulance picked them up and brought them back to camp. Lily had lost a shoe, and was definitely off. Thankfully some farrier magic helped her feel better quickly. Once she ate and drank, she was fine. Carlos and Gracie did finish, but were far over time and so they did not complete. Q enjoying some much deserved watermelon post race. 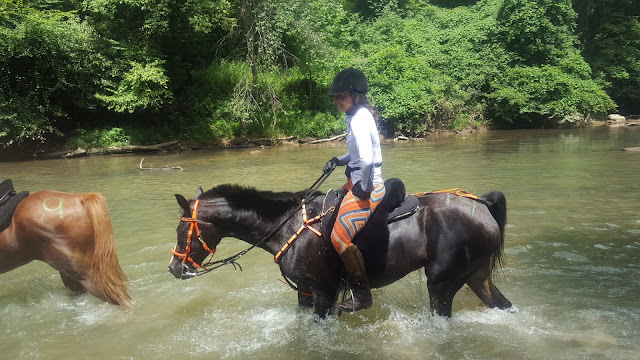 Once the horses and camp affairs were settled, Liz and I grabbed some beers and headed down to the swimming hole to wash off the ride and celebrate healthy horses for everyone. Nicole looks lovely, while in the background I, apparently, am hatching evil plots. The ride festivities continued into the evening with a big dinner and awards ceremony. 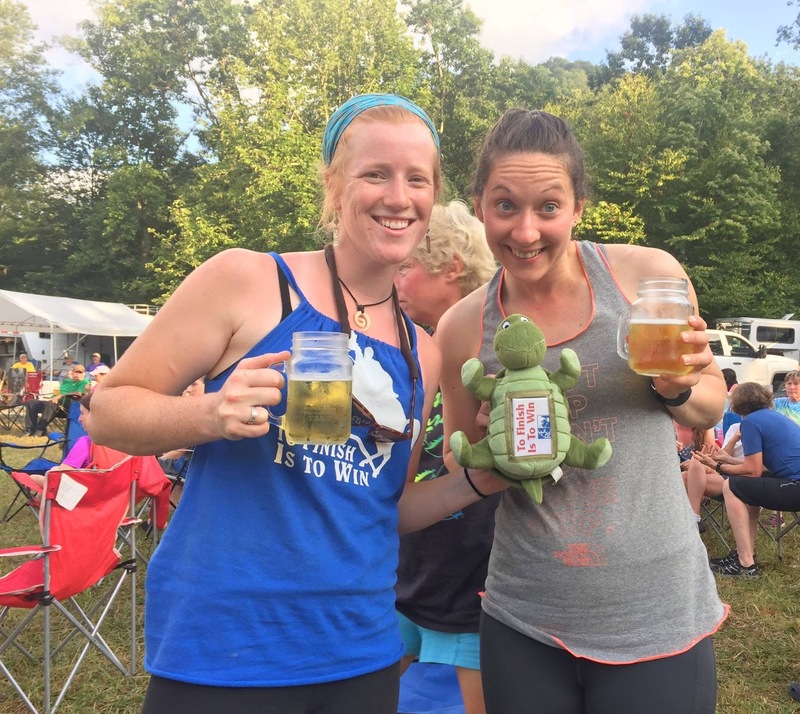 Finishers received a beer mug and access to the keg. In addition to our completion prize, Liz and I shared the stuffed turtle marking our prestigious last place tie. Don't lie. 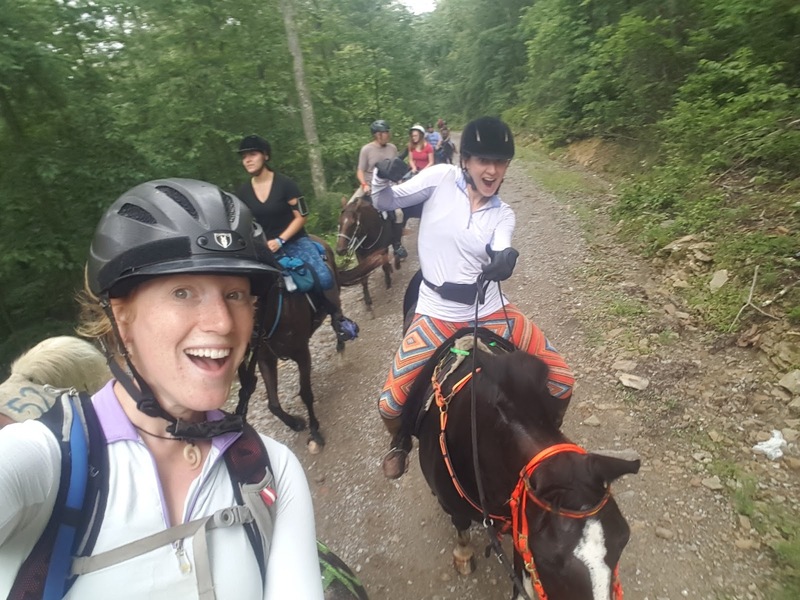 You'd totally trust us to ride your horse 30 miles over some of the toughest terrain in the US. Silliness aside, Ride Between the Rivers was an amazing experience. 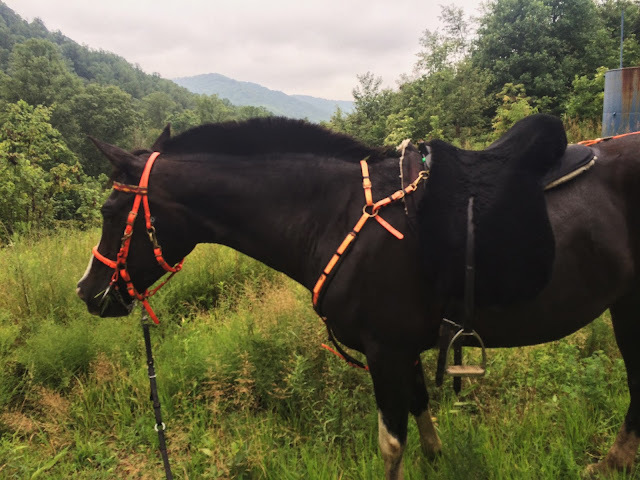 I might have left West Virginia little addicted to the sport of endurance, and with even more respect for the crazy things our horses do for us. I want to extend a HUGE thanks to Liz for all her mentor-ship, and for giving me the chance to experience such a wild adventure. Wow, this sounds like a really awesome experience! I have been waiting for this next section! 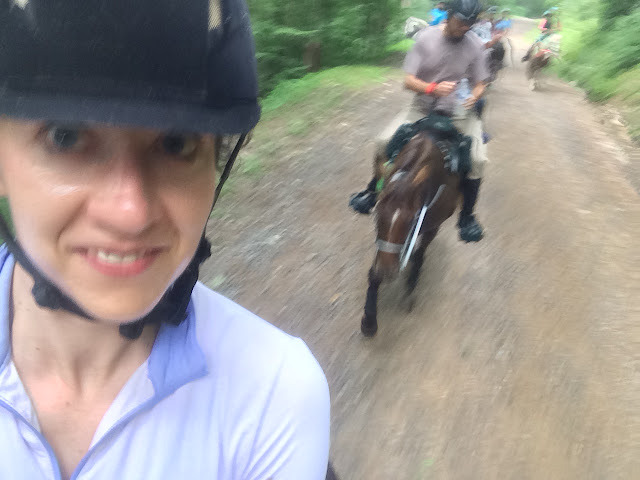 I love reading a dressage rider's perspective on endurance. 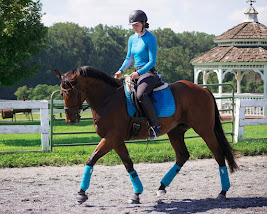 I have a dressage background and love how dressage helps any horse, but especially endurance horses. I have read a recap from a hunter trying her first LD and this is a nice counterpart to that! For what it's worth, I think you really looked the part for this ride! Riding a fit endurance horse is very different than any other discipline, I think. I remember watching in awe when I first started the sport and the 100 milers would go out at a steady trot in the morning, and then come back almost 24 hours later at the same steady trot. 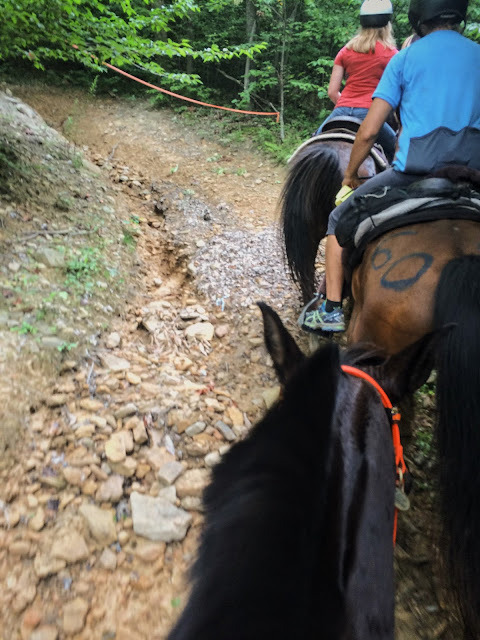 As an aside,it is not a good idea to sponge your horse's hindquarters on trail (or in camp). We generally stick to the neck, shoulders, and chest. Sponging the back or haunches with cold water can cause muscle soreness or even cramps! I loved your description of the vetting process. When I try to explain endurance to others, I make my explanation too convoluted and sort of lose the point. I am going to just refer people here from now on! I love the windy section of trail through the woods after the river crossing. So lovely! And you're right, lead changes do make it more fun! (Both Steel and Moniet have easy lead changes and glide through sections like that!) Great post and I'm glad you enjoyed your foray into our insanity! I hope we'll be seeing more of you on trail in the future, and I'm thrilled to see Liz getting more into dressage with your influence! It was so fun to poke around with Q and see how adjusting her way of going slightly changed her balance. I love teaching green horses lateral movements for that reason, so it was really just more of that. The bit about sponging the hindquarters makes sense. I usually don't worry about things like that, because my horses aren't ever depleting their electrolyte stores enough to worry about cramps! Good insight!! This is such a fantastic post! I think it's amazing that you did this ride, what an experience! VERY cool experience. I hope to do an endurance trial some day. You and Q are on point with your matching game. Dude looks like so much fun! Hi Mary! So happy you chimed in! 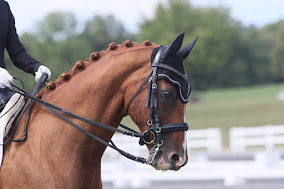 I love that you've seen such a connection between dressage and endurance. Plus, I really respect the work you've done with Shiloh. 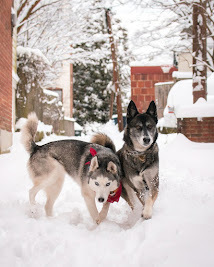 As the owner of an older (though nothing on Shiloh!) athlete, I know how hard it is to keep them looking good and performing at their best. Shiloh looked AMAZING, and I am in total awe. What a great write up, I love reading cross-discipline experiences. I love the camaraderie of endurance, even when you are competing for times. 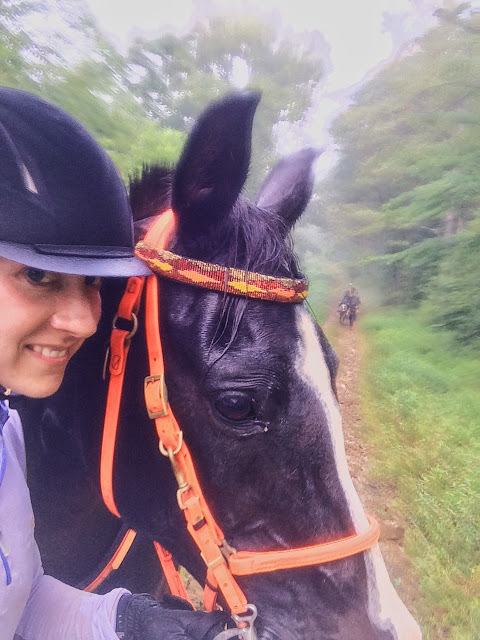 When I was 18 I ended up on my first ride, a 50 mi solo, so when my horse and I nearly plummeted to our deaths (only half dramatic) a stranger stopped, watched us trot out and let me tag along for a bit until I regained my resting pulse lol. I'm way older, out of shape, but would do one again in a heartbeat. Wow! What a great story! I'd love to hear more! Loving your account! And kudos for doing a 30-miler your first time out! I live in Scotland, with an endurance pony (50-miler) and a little dressage horse, so play in both disciplines, and I love how open you are to the new experience, while thinking about how your skills can cross over. I think some pure dressage people forget sometimes that it's meant to be training for your horse to be out in open country, and that the arena is just a way of measuring those skills!